The Idaho Falls Chukars split a doubleheader on Friday night as they lost 3-1 in the first game and won 6-1 in the second game against the Orem Owlz at Melaleuca Field. 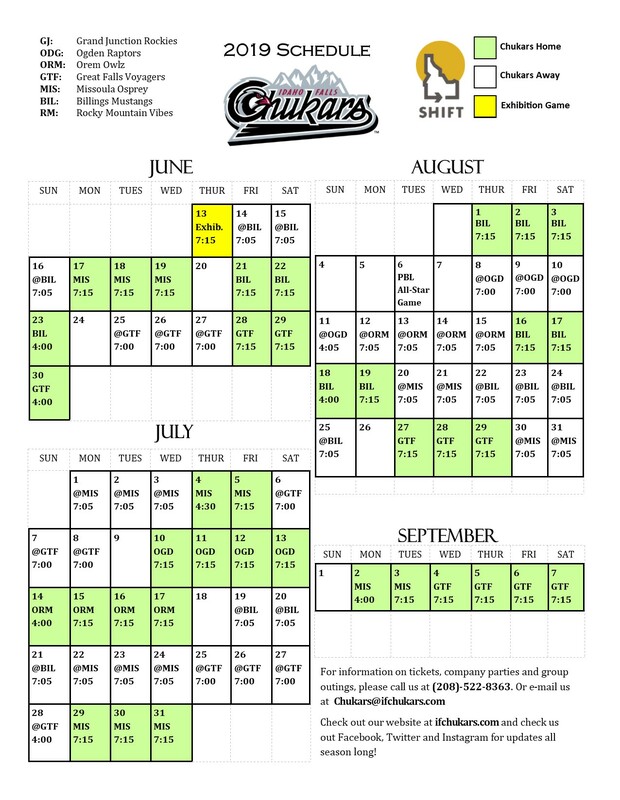 With Grand Junction winning 11-4 over Ogden, the Chukars are 2 games back with 5 games to play. In the first game, it was a 1-1 tie going into the 7th inning, where Jeremiah Jackson hit a 2 run homer to right field off Jon Heasley to give the Owlz a 3-1 lead, which held up to give Orem their 21st win of the season. Idaho Falls was held to 4 hits in the game. Rubendy Jaquez went 2 of 2 with a walk. Jaquez went 2 for 3 with an RBI as he went 4 for 5 in the 2 games. Heasley struck out 4 batters with no walks in 5 innings, allowing 5 hits in his first relief appearance of the year. Bubba Starling hit a solo home run in the 4th inning of the first game. Starling was playing his 3rd game of his rehab assignment. Starling was the 5th overall pick of the 2011 draft. In the second game, it was a scoreless game through 4 innings. Orem scored a run in the top of the fifth inning. Idaho Falls responded in the bottom of the 5th. The inning led with walks by Hunter Strong and Jesus Atencio, both off Orem pitcher Emilker Guzman. The next batter, Julio Gonzalez hit a 3 run triple as he scored on a throwing error, rounding the bases and with 1 swing of the bat, it was a 3-1 Chukars lead. Elvis Luciano pitched 6 innings, allowing 4 hits, 1 unearned run in the 2nd game as got the win in his Chukars debut. Domingo Pena pitched a scoreless 7th inning to secure the 6-1 win in the second game of the twin-bill. The final meeting between the 2 teams is Saturday night at Melaleuca Field. 7:15 pm first pitch as Rito Lugo pitches for the Chukars against RHP Cristopher Molina for Orem. Chukars notes: Both teams had 11 hits each in the 2 games. Nate Eaton went hitless in the 2nd game of the doubleheader, ending his hitting streak at 8 games. He still has a base hit in 17 of his last 19 games. Nick Hutchins went 1 for 3 in the 2nd game Friday to extend his hitting streak to 9 games. Tyler James missed his 15th straight game due to an injury. He has hit in 18 straight games. Rylan Kaufman went 2 innings in the first game as he made his Chukars debut. He allowed 1 unearned and 2 hits, striking out 3. 4 of the 7 Chukars hits were for extra bases in the 2nd game. The Chukars had 4 stolen bases in the 2 games. He now has 102 stolen bases on the year. Attendance was 2,252.